By popular request we are offering another opportunity to paint and draw at magical locations in this area of outstanding natural beauty. Depending on the weather, we will be visiting some beautiful local houses or gardens or concentrating on the picturesque grounds of Jessops Farm itself. 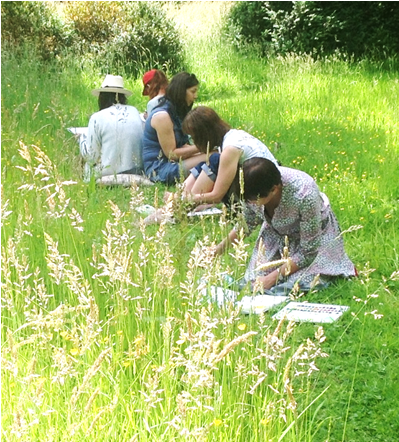 The weekend will give you some experience in the pleasure of painting and drawing in the open air (plein air). Cathy will be offering as much guidance as you feel you need. 10.30 - 12.30: Morning session –set up at our chosen nearby location. (possibly the grounds of magical Falconhurst or some other local garden). You will be spoilt for choice wherever we go. 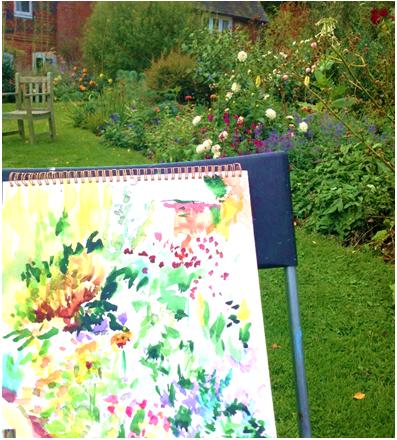 1.30 - 4.00: Afternoon Session - A chance to complete your painting or start another subject in another area. Cathy will be making the rounds, offering help and advice. 10.30 - 12.30: We will look at what has been successful from the previous day. There will be a short demonstration from Cathy on how to take your painting to the next stage. Then out into the countryside. 1.30 - 4.00: Afternoon Session - Weather permitting, you will have a chance to use what you have learnt or experienced to paint another scene. Otherwise we will work on your paintings in the studio. "Cathy is a dedicated artist who takes trouble over every student whatever their ability. Her classes are also friendly and highly enjoyable."